Launch of Anita Dongre Flagship store at DLF Emporio New Delhi | The Shopaholic Diaries - Indian Fashion, Shopping and Lifestyle Blog ! Wishing you all a very Happy and lovely September. Last week I was invited over to attend the launch of renowned designer Anita Dongre's flagship store at DLF Emporio, New Delhi, amongst a swish gathering of the Delhi and Mumbai glitterati. The sprawling 3000 sq ft. luxury store, exudes the charm and vivacity of Rajasthan, and offers a unique selection of bridal, couture, pret and bespoke jewellery, to the luxury connoisseur. Guests, who were seen enjoying an evening that spelt luxury and elegance, included the gorgeous Dia Mirza, Pernia Qureshi, Radhika Chanana, Sujata Assomull Sippy, Harmeet Bajaj, Suneet Varma, Sandeep Khosla, Anupama Dayal, Neeva Jain, Gudiya Bawa, Divya Burman, Niharika Khan, Urshila Chanana, Ameeta Seth, Alpana Gujral, Anita Bajaj, Gaurav Gupta, Promila Sibal, Shabnam Singhal, Anjali Gaekwar, Caroline Young and Pradeep Jethani of Jet Gems, to name a few. A gracious host, Anita personally welcomed the guests and was joined by her brother Mukesh Sawlani. Film director, Onir dropped in to meet Anita with, the cast and crew of his forthcoming film "Shab" which included actor Arpita , Ambika Suri, Ashish Bisht and Raj Suri. 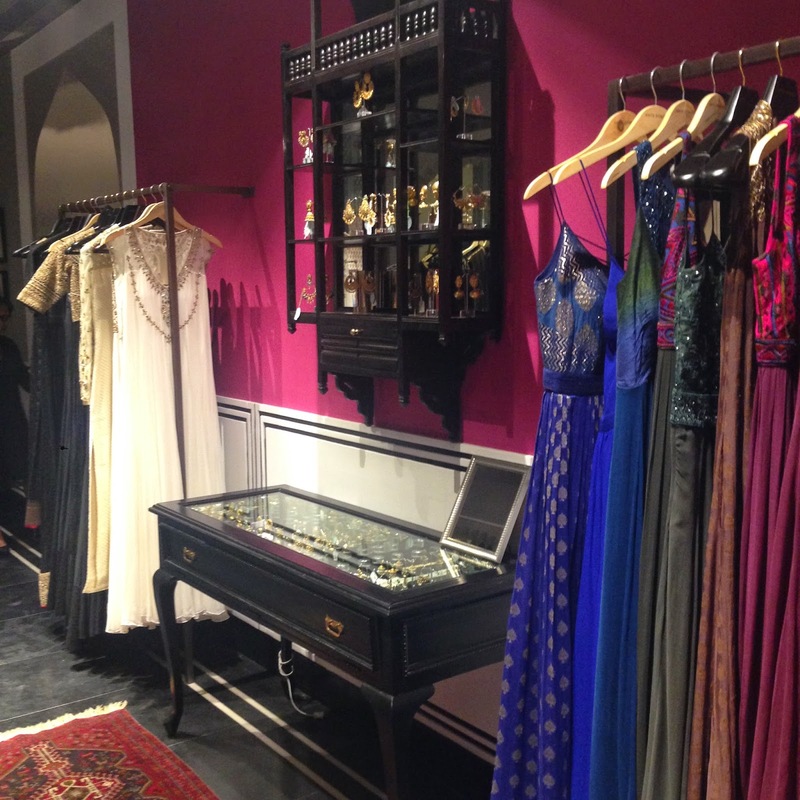 Commenting on the launch of the store, Anita Dongre said, “I am excited to launch my store at Emporio, and look forward to sharing the Anita Dongre design aesthetic with style connoisseurs of New Delhi. My design philosophy is elegant, feminine yet comfortable and I present my vision, through my latest collection ‘India Modern’, seeped in heritage without being weighed down by decorative detailing". Dia looked stunning in an Anita Dongre pink bandhini kurta with gota patti work, paired with pink trousers and a net dupatta. Sangeeta Bijlani wore a blue raw silk front buttoned dress, with embroidery detailing on the cuff. Don't you think Dia looked really gorgeous in her outfit? 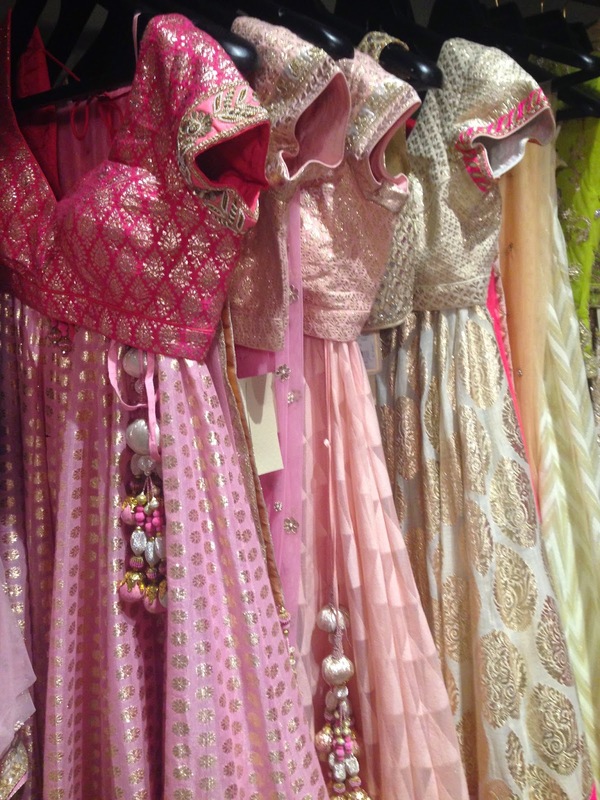 The store in itself has a luxurious and rich feel desired by every Indian bride, and is a must visit if you are a fan of Anita Dongre's designs. More than her collection, I have fallen for her studio's interior decor. So divine! Wow ...love Diya's bandhini Kurta!